Blending chalks are just that, chalks that are blendable. Blending chalks can also be called chalk pastels or soft pastel chalks. Chalks can be used on a variety of surfaces, including polymer clay. Their color can be easily applied with a brush, sponge tip applicator, or even cotton swabs. 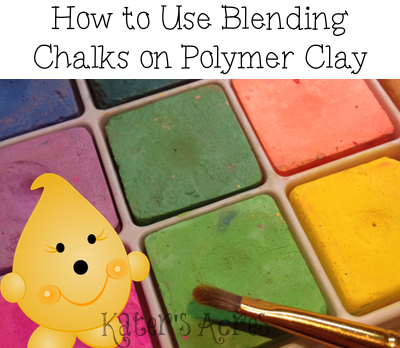 Chalks will cling onto the surface of the clay and add a very nice & subtle wash of color, in the same way that soft pastels can do for polymer clay. While chalks are not a permanent color solution for polymer clay, once a piece is sealed the color will be steadfast. Because these chalks tend to be pigment rich, they are easily blendable with buildable color properties that I absolutely love. Because I make whimsical figurines, chalks are an everyday work-horse for me. In fact, my blending chalks are used so much that they sit right next to my work surface. On a soft, real hair brush. When you place the color on a small soft haired brush, it can easily provide a slight wash of pure color (there is generally no mica in pure blending chalks) or buildable color. On a cotton swab. When I want to add just a round “dot” of color, I gently twist a cotton swab directly in the pan of the chalk. Using a gentle motion, I lightly “dot” the surface of the clay as many times as needed until full color is achieved. On your fingers. Sometimes the coolest color effects can be achieved by taking a wet finger and rubbing the surface of the blending chalk block and then rubbing my finger over a stamped design. Have you ever used chalks? What’s your favorite way to use them on polymer clay? Leave your thoughts in the comments below. I recommend using Mungyo pastels on polymer clay. They are inexpensive, highly pigmented, and work wonderfully. I love to use chalk on my greeting cards – it’s just a hint of color that does the trick – and if you get outside the lines or make a mistake, you just use a rubber eraser. There times I don’t even set the chalk! I find this much easier than watercolor – there no mess, no buckling of the stock and you can set it if you wish – there is stuff out there just for that purpose! my problem is finding the right covering for on top of the finished piece to help the pastel not rub off. You can always use liquid clay after it’s baked and then rebake it. That’s the best way to insure that the finish will be compatible, as clay is compatible with clay. Hi Katie! I am curious to know what brand the pastels are that are shown in the first photo. They almost look like they are in a makeup tray. Thanks so much for sharing such great information! The link does not work for me. It takes me to my amazon but doesn’t pull up anything. Can you tell me what brand it is so I can look it up? Hi Tracy! The link is working fine on our end and the name of the chalks is at the bottom of the post, but here it is again for you: Mungyo Non Toxic Square Chalk, Soft Pastel, 64 Pack, Assorted Colors. You can get them on Amazon here: https://amzn.to/2qVfYzL In the US the average about $6.98 for the half sticks which should last you a nice long time. Thanks Katie that one worked for me. Kind a weird but that’s my phone for ya. Link doesn’t take me there either. I added the link in the comments and the name is in the post. Please do a search by the name if the link isn’t working for you. Hi Jude, Chalks need to be added before the clay is baked. You can use them after the clay is baked, but you will need to use far more. I would suggest using a small fine brush and oil paints after the clay is baked. You will like the results better. No problem! Let me know how it goes! Does this product require baking to make it color fast? Can I use it with concrete? What products can I use to protect my surface? Polymer clay MUST be cured in an oven by baking. Different polymer clays require different temperatures to bake at. I have several articles on the site to help you. The polymer clay is a type of plastic/vinyl material when cured. It is lightfast to a point. UV light will break down the color over time, no different than a porch chair that is out in the sun all the time. You can take CURED tiles of clay and embed them into concrete as a mosaic, yes. You can use just printer paper to protect your work surface. Also the craft sheets from craft stores will work as well. If you join the email list you’ll get lots of new information too. Can you tell me where I can purchase these, and if they could be added to white clay to make entirely new colors? I get mine at big box stores. They are $20 a set. But you can use a coupon on them! I’ve also linked them to Amazon if that’s easier. I have these and was wondering why they were so terrible for my other projects. Thank you for letting us know about these! I bought a few PanPastels but haven’t tried them yet. They are very expensive so I wanted to make sure they are good before I really invest in them more. Have you used the Pan Pastels? Hi Michele! I have tried PanPastels and I love them, however they are so richly pigmented that the color isn’t nearly as soft and buildable as I can achieve with these. When I want strong & vibrant color right away, I will use PanPastels. I just recently got this same chalk set and haven’t had a chance to really play with it. What I have done is very pleasing though. I quickly realized the buildable aspect and love it! Interesting! Do you know if these different from chalk pastels? I don’t actually know how different they are in composition. What I can say is that these are very richly pigmented. Perhaps it’s just the brand that I have, but my chalk pastels are not pigmented as richly. Plus these are smaller and take up less space on my work table since I have them out all of the time. The entire case is about 8″x6″. Are you using these before baking? And can you mix them for different color? Hi Barbara! Yes, I use these before baking. The color (like pastels) will NOT stick after baking. I’ll make a note of that in my article. This sounds like so much fun. Due to my recent surgery I am unable to work in my studio, but I am printing all your wonderful projects and creative ideas. I can’t wait to get back to my clay and try these. I hope you can get back to claying soon Bobbie! When you do, be sure to get some of these and try them. Then come back and tell me what you think of them.